According to Dictionary.com, “juju” is: “1) an object venerated superstitiously and used as a fetish or amulet by tribal peoples of West Africa; 2) the magical power attributed to such an object;” and/or 3) “a ban or interdiction effected by it.” Juju can be good or bad, but above all, it is powerful. So are San Francisco Bay-based Joshua Howell and Pete Devine on their sophomore album, which is almost “eerily” good. They know how to balance on the razor’s edge between traditional and present-day blues, as they present Modern Sounds of Ancient Juju. 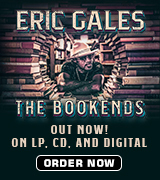 They don’t go all the way back to tribal Africa in their musical style, but swamp-tinged Cajun influences can clearly be heard (“She Brought Life Back to the Dead”). On eleven tracks – six covers and five originals – they bring revered as well as contemporary classics to life. 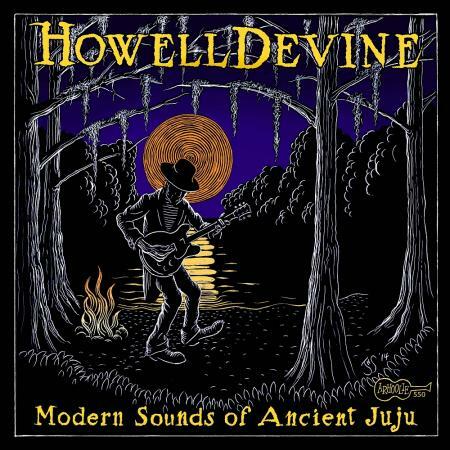 HowellDevine consists of Joshua Howell on guitar, harmonica and vocals, Pete Devine on drums and washboard, and Joe Kyle Jr. on upright bass. 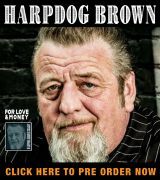 Their homepage and promotional info sheet reveal rave reviews from such blues rock greats as Charlie Musselwhite, Bonnie Raitt, Elvin Bishop, and Maria Muldaur. In the CD liner notes, writer Musselwhite states: “There’s tasty slide, harp and rhythm with relaxed vocals that all blend together for a wonderfully satisfying experience”. How right he is, especially on these three outstanding original offerings. Track 04: “Let You Go” – Despite the jaunty tone of track four, its message is one of cold fury: “Well, your boots are scuffed and ratty. You’ve been knocking them all night long. You’ve been keeping late hours, and I know something’s going all wrong. One of these days, you’re going to beg me not to let you go.” Revel in Howell’s killer slide solos and Devine’s washboard grind. Track 07: “House in the Field” – Our narrator is up to no good in this stomp. To what dubious domicile does he want to take his heart’s desire? “It never seems fair; I want to get you alone. Got a change of plans ‘cause our parents aren’t home. Now, listen up, baby – I’ve got an idea. Let’s meet at four o’clock in that house out in the field.” Turning an abandoned shack into a love shack has never sounded more sinfully appealing. Only one thing could have made track seven better: the subtle echo of a rattlesnake’s rattle at the end, to top it off. Track 11: “Railroad Stomp – Live in Port Richmond, CA” – What is the timeless blues appeal of train songs? They’re musical journeys in and of themselves, and this one’s phenomenal. When melody and instrumental sound effects are combined perfectly, these kinds of tunes allow listeners to fall into a trance and dance – or jump up and down, as the case may be. All aboard! 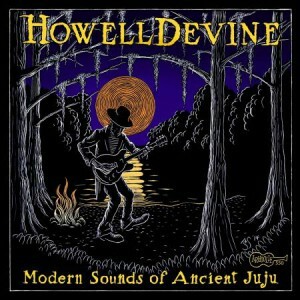 HowellDevine are masters at evoking The Modern Sounds of Ancient Juju!